Design and print ID cards with use of advance card designing objects including Line, Ellipse, Pencil, Rectangle, Text, Barcode, Picture, Arc, Triangle and Star objects. 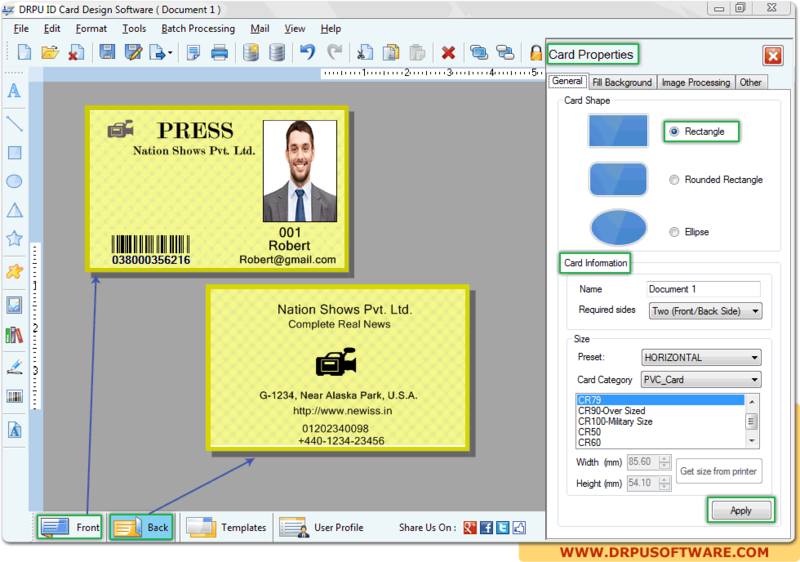 ID card design software is useful to design professional looking ID cards in few easy mouse clicks. Use ID Card Design Software to design Employee ID card, Student ID card, Security ID card, Visitor ID badge creation process in minimal time and efforts. Design and create card and label in Rectangle, Rounded Rectangle or Ellipse shapes. Option to specify the color and background settings of created ID card including Solid Color, Gradient, Image and Style settings. Option to print created ID card using advance print settings. Generate the multiple copies of ID card with different barcode and text value with bulk image printing process.